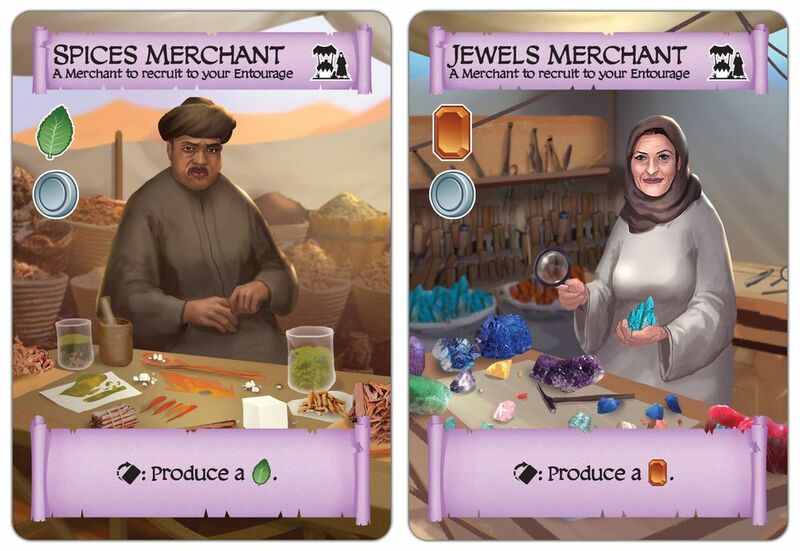 What is Merchants of Araby like? Merchants of Araby is all about getting a large entourage, selling goods, avoiding bandits and above all else, negotiation! The goal of Merchants of Araby is to get as much money as possible by shipping goods either through your own or the other player’s caravan. Each turn players resolve their caravan card, add cards to their entourage, task cards in their entourage or add camels to their caravan. The caravan cards allow players to place camels on one of 9 spots if they can use one of their or their opponents entourage cards to create the product. If one or more rows are complete by the time your turn starts, then you gain the money underneath the camel unless…the bandits attack. When the bandits attack they attack a specific location on the caravan and if a camel was there, well it gets taken away by the bandits. Once the caravan has been resolved the players take a new one. Each of the cards that can be added to the entourage will provide the player with an ability, either to produce the different type of goods (magic, spice, fabrics and jewels) or give you other abilities. A player can do as much as they choose or can afford on their turn as their are no specific number of actions. 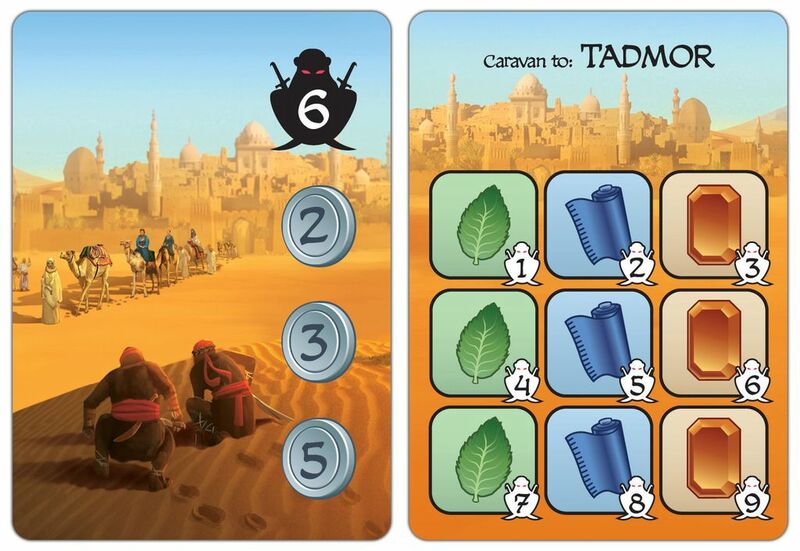 Tasking cards in your entourage can allow you to produce goods, which can allow you to play a camel on your own caravan. However, sometimes the goods you produce are not the goods you need for your caravan and that is where the last option of your turn comes into play; negotiation. On any player’s turn you may negotiate anything and everything (almost) in order to get something you want from someone else. If you want to place one of your camels on someone else’s caravan; trade for it. Maybe you want a card someone grabbed last turn; trade for it. The only limitations to the negotiation is that your entourage can only be used once for your turn and then once throughout every other player’s turns. That means each card can only be tasked at maximum twice during one round of the game. The other limitation is that current turn negotiations are binding, while future turn negotiations are not, so be careful! Djinn cards are also allowed to be played on any player’s turn. They are one-time use cards that allow the player an extra bonus for that turn. When you resolve the caravans, at the beginning of the turn, only complete rows or columns will score and each row has an increasing level of pay out, but also potential for being sacked by bandits. Even if you complete a row or column for yourself or another player, you may not get a payout if your only camel is destroyed. 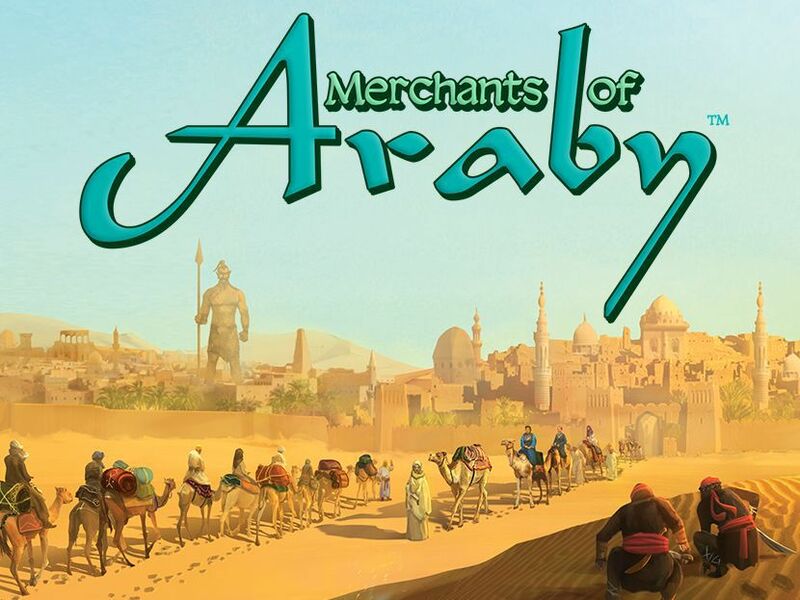 Merchants of Araby is a solid game with fun interaction between the players. It is an easy game to explain and get the basic rules, but there is a definite learning curve as to what to trade and when. Inherent in the negotiations aspect is some risk and reward calculation. If you agree to task a member of your entourage in order to place a camel on the other player’s caravan, then you have to hope that your camel isn’t the one hit by the bandits. Maybe you give someone a couple coins (which double as victory points) in order to place your camel on their caravan after tasking someone from your entourage, will it burn you like it did me and make you lose by one point? My only major issue occured when I played with someone who did not negotiate at all. It was almost as if she wasn’t playing the same game and she lost badly because of it. When I play again, I will definitely have to stress that negotiating is key to winning the game and hopefully that will resolve the issue. Player interaction and trading everything! If negotiation was not a part of this game, then I would say that the complexity would be closer to a 2. But the fact that anything and everything may be traded kicks it up to the next level. As far as the mechanisms go, though, it is an easy to learn game, but strategically it can be much harder.